One of the most cost-effective ways to make your home more comfortable year-round is to add insulation to your attic, including the attic trap or access door. By sealing uncontrolled air leaks, points out the U.S. Department of Energy, you can save 10 percent to 20 percent on your heating and cooling bills. Fortunately, this can be a relatively easy task. An improperly insulated attic can be a preventable source of energy loss and unnecessary expense. 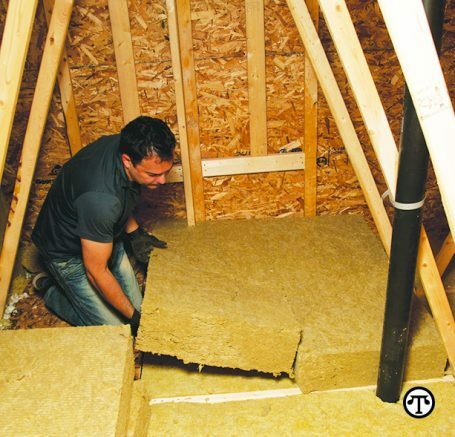 Over time, insulation can settle or compact, which reduces its R-value. An insulating material’s resistance to conductive heat flow is measured or rated in terms of its thermal resistance or R-value — the higher the R-value, the greater the insulating effectiveness. A breezy attic may also result in drifts or shifts in your original insulation, leaving gaps where heat can escape. By topping up your attic insulation, you’ll increase the thermal level, reducing your overall energy usage and saving you money. For further facts and tips on insulation, go to www.rockwool.com/­products/ comfortbatt. Be the first to comment on "Upgrade attic insulation to save on energy expenses"